DHARAMSHALA: Education Kalon Ngodup Tsering presided over the 56th anniversary of the Tibetan uprising day in front of the UN building in New York on 10 March. The rally was organised by Tibetan Associations, Regional Tibetan Youth Congress, Regional Tibetan Women’s Association and Reegional Chushi Gangdruk of New York and New Jersey. Other dignitaries who participated in the rally include Mr Tashi Namgyal, member of Tibetan Parliament-in-Exile, and Kasur Lodi Gyari, former special envoy of His Holiness the Dalai Lama, Kasur Lobsang Nyandak, Tibet Fund director Rinchen Dharlo, Mr Robert Thurman, Ms Ngawang Sangdol, former Tibetan political prisoner, president of Himalaya Sherpa Association and Mr Tenzin Ignyen of the Office of Tibet. Kalon Ngodup Tsering raised the Tibetan national flag as the gathering sang the national anthem. Mr Tenzin Ignyen of the Office of Tibet read out the statement of Sikyong Dr. Lobsang Sangay on the occasion. Addressing the gathering, Kalon Ngodup Tsering called on Tibetans in exile to maintain and strengthen unity to deal with the political challenge and fulfil the aspirations of Tibetans inside Tibet. He underlined the need to follow the visions of His Holiness the Dalai Lama and explained the core essence of the Middle Way policy being pursued by the Central Tibetan Administration to resolve the issue of Tibet. He urged the elder generation to focus on education of children and inculcate in them the values of loyalty to Tibetan cause, language, culture and morality as the latter will be the ones who will the future Tibetan political and social condition. Later in the evening, Kalon Ngodup Tsering attended a prayer service for Norchuk, a Tibetan woman who recently burned herself to death to protest against the Chinese rule in Tibet. Addressing over a thousand Tibetans at the prayer service, he reiterated the need to pool our efforts and strength on education, which he said is the key to sustain the Tibetan movement. He spoke on various programmes of the education department, core essence of the Middle Way policy and called for the need to strengthen unity as envisioned by the Kashag while keeping in heart the aspirations of our brethren in Tibet. 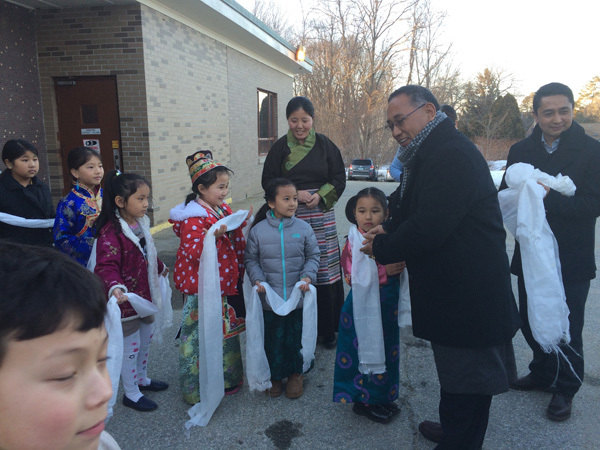 On 11 March, the education Kalon visited the Tibetan community in Connecticut. He listened to the presentation of poems by schoolchildren and announced to the public the City of Connecticut’s declaration of 10th March as the Day of Tibet as a gesture of strong support for the Tibetan people. 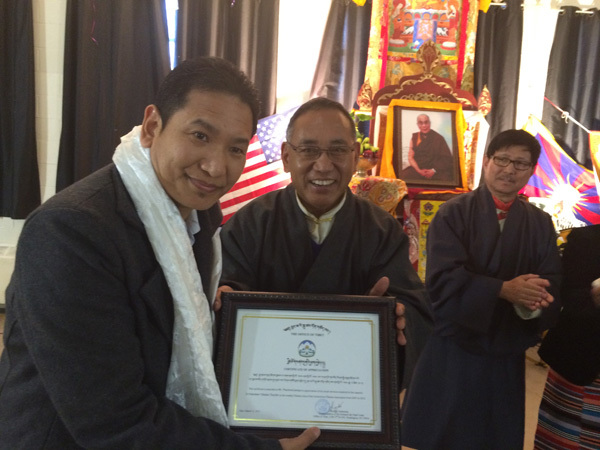 He distributed certificates issued by the Office of Tibet to volunteer Tibetan teachers to honour their service. On 12 March, he left for India after successfully the visit to US and Canada.